and other types that are NOT food grade! Food grade hydrogen peroxide is a type of peroxide that does NOT contain stabilizers. That means it is JUST hydrogen peroxide, without any additives. Food Grade is the only type of peroxide that has NO stabilizers in it. 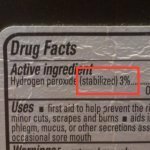 Why Would Hydrogen Peroxide Contain Stabilizers? Hydrogen peroxide is very unstable (which is part of why it works so well). It decomposes into oxygen and water, and lots of things can cause it to decompose. (It's the released oxygen that does the work.) This is very convenient for disinfection and bleaching, but not so convenient for putting it in bottles that stay shelf-stable for long periods of time. Stabilizers make it safer and more convenient to store hydrogen peroxide, and store it for longer. Without stabilizers, peroxide is more apt to break down. 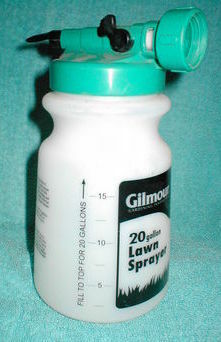 (Stored in a dark plastic bottle, with no contact with other material, the breakdown will be quite slow.) In some conditions, peroxide could break down so much over time that the package bursts. (If you buy 35% hydrogen peroxide, the container should be vented to allow small amounts of oxygen to be released.) Peroxide with stabilizers can be stored for a longer time without losing any of its potency. Without stabilizers, peroxide that is stored in a cool dark place will lose only a little bit of potency (its a very slow process), but stabilizers make it ...um... more stable. Which is convenient for a packaged product that will sit in warehouses or on drugstore shelves, possibly for years. What are the Stabilizers Used in Hydrogen Peroxide? I have not found a source of information that lists all the kinds of stabilizers used in hydrogen peroxide (and I'm not sure that is even possible, as stabilizers vary among manufacturers and could change). Some of the stabilizers used are acetanilide, phenol, sodium stanate, sodium stanate, sodium pyrophosphate, tetrasodium phosphate, and tin. 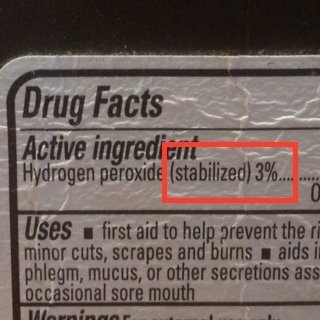 The packaging for hydrogen peroxide does not have to tell you what stabilizers have been added. Sometimes it WILL say that it is stabilized though! Here’s a photo of a part of the label on a brown bottle of 3% hydrogen peroxide. Notice it says "(stabilized)". Some types of peroxide may also contain other additives, in addition to stabilizers. This information is from here: "Other additives may include nitrate (for pH adjustment and corrosion inhibition) and phosphoric acid (for pH adjustment). Certain end-uses -- which depend on the bleaching ability of H2O2 in alkali – utilize colloidal silicate to sequester metals and thereby minimize H2O2 decomposition." Why Do People Prefer Food Grade Hydrogen Peroxide? Why Do People AVOID Stabilizers? Stabilizers are additives, and can be toxic, or unwanted. Generally for applications that involve contact with humans or other animals, there is a very strong preference for NOT having any additives. Food grade hydrogen peroxide is the type that many people prefer to use, as it does not contain stabilizers. Food grade hydrogen peroxide is made for use in commercial food processing, thus the name "food grade". Spraying aseptic packaging to help sterilize it (before filling with food). Bleaching instant tea, lecithin, colored cheeses, and other food products. Some people ingest (drink) VERY VERY diluted hydrogen peroxide. (Note this means VERY diluted – like a few drops of 35% peroxide in 8 ounces of water or more.) Yep, this is a very controversial idea. And, as you might suspect, avoiding stabilizers is considered essential in this case. Some people also put VERY VERY dilute HP into the water of chickens and pigs and other animals. (Again this is VERY dilute.) Avoiding stabilizers, here too, seems worthwhile and necessary. What about for body care -- like for swishing in your mouth, for cleaning cuts, or for soaking your feet? You’re not actually ingesting the peroxide or putting into something people eat... but you are putting the peroxide in your mouth or on your skin. So, many people prefer to use peroxide without stabilizers. On the other hand, some people certainly do use drugstore peroxide (which has stabilizers) for mouthwash. I would prefer to use food grade hydrogen peroxide, because it has no stabilizers. Are There Some Applications Where it Doesn't Matter if There are Stabilizers? For things like carpet cleaning, and cleaning countertops, the stabilizers are probably less of an issue. Still, there's something to be said for using fewer chemicals. Because they do end up somewhere. I guess it is a matter of opinion? If you don’t want to add any unneeded chemicals, you’ll always want food grade. Still, there is less concern about stabilizers when you use hydrogen peroxide to whiten laundry then when you put it in your bath, or swish it in your mouth. What are Some Other Grades of Hydrogen Peroxide? Pharmaceutical Grade (usually 3%) — This can be purchased at the drugstore and is used for cleaning wounds and as a general household disinfectant. This grade will generally contain stabilizers. Beautician Grade (3 to 12%)— For use as hair bleach and contains stabilizers. Reagent Grade (usually 30%) — Used in scientific experiments, also contains stabilizers. Electronic Grade (usually 30% to 35%)— Used to clean electronic equipment. Contains stabilizers. Technical Grade (usually 35%) — Contains a small amount of phosphorus to neutralize any chlorine in the water it is combined with. Food Grade (usually 35%) — This is used in many food preparation processes, for instance, in aseptic packaging and bleaching some processed foods. How About Using Food Grade Hydrogen Peroxide for Everything? At some point, if you are buying food grade hydrogen peroxide for some applications, it may become just as easy to use food grade for everything. That is, even for laundry and housecleaning. And if you buy it in quantity, it can be very inexpensive. A cup of food grade hydrogen peroxide costs me roughly USD $1. So, a gallon of 3% costs me, roughly, USD $1.25. A bath will cost me a bit more, depending on how much hydrogen peroxide I use. For house cleaning, cleaning cutting boards, mouth wash and the like, a gallon of 3% lasts me a few weeks. I keep this gallon of 3% hydrogen peroxide in a bottle that is clearly marked "3% hydrogen peroxide". I sometimes have bought 15 gallons of 35% hydrogen peroxide at a time. This is enough to make 180 gallons of 3% hydrogen peroxide. 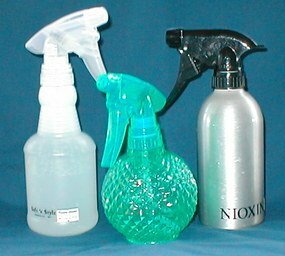 I keep a plastic bottle or two of 35% peroxide inside the house. These are clearing marked with DANGER labels. I use this 35% concentration for adding to the bath-tub-full of water, and for mixing to make 3%. (I do not put 35% hydrogen peroxide into glass bottles, as I don’t want any risk of dropping and breaking the bottle. I do keep 3% hydrogen peroxide in a glass bottle, it is not especially hazardous if the bottle breaks – still, plastic would be safer.) It is critically important to mark all bottles as to the concentration, and any bottle containing 35% food grade hydrogen peroxide should be marked DANGER. Does Food Grade Peroxide Require Shipping as a Hazardous Material? Shipping requirements depend on the concentration. 35% hydrogen peroxide and 20% hydrogen peroxide require shipping as hazardous materials. It doesn’t matter if it is food grade or not. It could have stabilizers and be packaged as a pool treatment -- and it is still a hazardous material based on the concentration (the % strength of the hydrogen peroxide.) See this page about concentrations for more info. Now, you may read things that say that food grade peroxide requires special shipping and is a hazardous material. That’s not exactly true. It IS true that food grade hydrogen peroxide is often sold as 35% concentration. And 35% DOES require shipping as a hazardous material. But you can buy 3% food grade hydrogen peroxide and it is not a hazardous material. 35% Hydrogen Peroxide requires extra fees and very special shipping procedures, regardless of grade. This is also true of any concentration greater than 35%.